All that you need to start your day at an armâ€™s length. Featuring this Industrial Age Weather Station, Bedol introduces a brilliant combination of modern design and practical function in the form of an all encompassing information center. 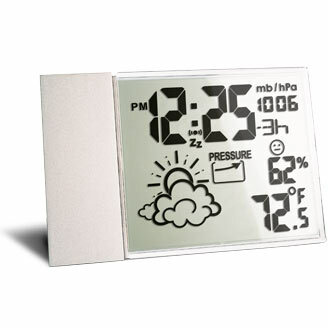 This Barometric Weather Station includes weather forecast, temperature, humidity, atmospheric pressure, time and date in one convenient display. With a built-in alarm with snooze setting, never again will you be rushing on your way out the door. The only thing on your mind should be whatâ€™s next on the task list after starting the morning on such a positive note.